NB: This recipe makes a large batch of sauce - enough for 8-10 portions. I used half to make spaghetti bolognese and the other half to make a lasagne. Halve the recipe if you want to make just the spag bol. Lasagna recipe to follow! I haven't added a quantity for the spaghetti as you might eat more or less pasta than us! I generally have 40g, with my husband and son having around 75g (all dried weight) I also use a low-calorie oil spray, but you can use a drizzle of olive oil if you prefer. Heat up a large saucepan, and spray in some of the oil. Add the onions, mushrooms, aubergine, and courgettes, and fry gently for about 5 minutes. You can add a splash of water to stop them from sticking, or a a few more sprays of oil. Add the garlic and continue to cook for another 5 minutes, stirring occasionally. Add the beef mince and stir until the meat is browned. Crumble in the stock cubes and add the rosemary if using. Pour in the Dolmio Original Bolognese Sauce - I then add a drop of water to the jar and shake it up to get every last bit of sauce out! Bring to the boil, then reduce the heat and leave to simmer for 10-15 minutes. Meanwhile, cook the spaghetti in boiling water according to the package instructions - should be around 10 minutes. 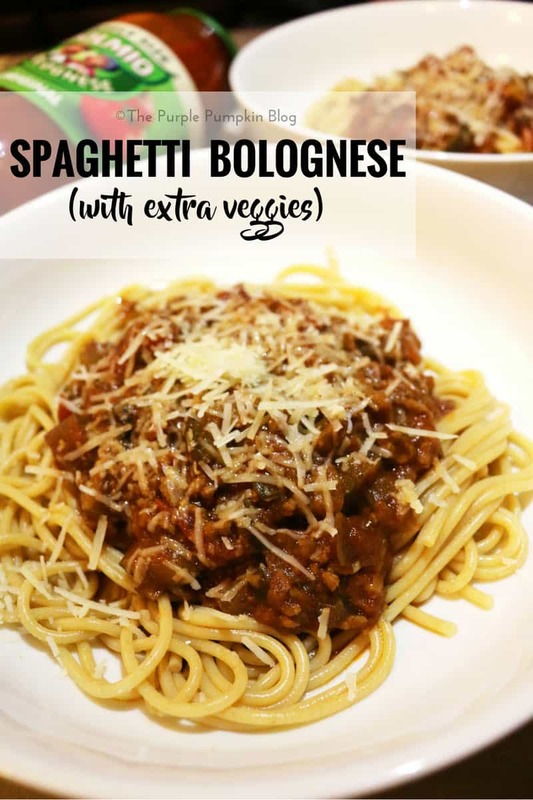 To serve, portion out the spaghetti into bowls, and add a serving of the bolognese sauce. Sprinkle with Parmigiano Reggiano if desired. I have also included the nutritional information, as I am counting calories at the moment. This information is approximate using online resources. I am not a doctor or dietitian, or providing medical advice and hold no responsibility for the complete accuracy of calorie counts and nutritional information. I advise you check your own resources if you are using recipes to lose weight. All weight loss programmes should be followed on advice from a doctor.